Jan and Steve Isaacson founded the Davis Musical Theatre Company (DMTC) in 1984. 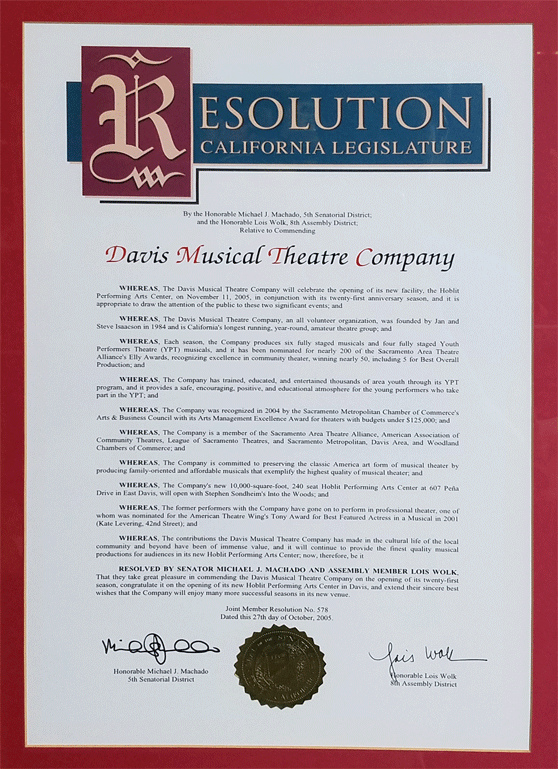 DMTC is California's longest-running, year-round, amateur musical theater company. DMTC produces 11 musicals each year. Six are "Main Stage" productions (adult actors). Five are "Young Performers' Theatre" productions (actors between 7 and 17 years old). You can see either an alphabetical list or chronological list of the musicals that DMTC has produced since 1984. DMTC currently performs at the Jean Henderson Performing Arts Center, 607 Pena Drive, Davis, California. DMTC is a non-profit corporation organized under the rules of the IRS 501(c)3. Donations to DMTC are 100% tax deductible. DMTC is an all volunteer organization from the Board of Directors on down. If you would like to get involved, please send e-mail to info@dmtc.org, call (530) 756-3682, or visit our Volunteer page. The mission of DMTC is to conserve the Classic American Musical art form. DMTC will endeavor to produce quality, affordable, family-oriented theatrical musicals open to all people. With both a Main Stage and a Young Performers Theater, DMTC will strive to involve a multitude of people and families seeking to make a contribution toward the preservation of the musical theater art form.